"This galaxy is vast; its wonders and beauty are almost unfathomable. But the galaxy also hides dark secrets, some of which have lain dormant since the beginning of time itself. There is a danger in secrets, both in seeking and in knowing. Some things are meant to be hidden from view. Some mysteries defy understanding, and sometimes even the things we think we know are untrue. Some secrets should remain untouched. Secrets can tempt your primal instinct, and lead you again into war. The Halos were one such secret." 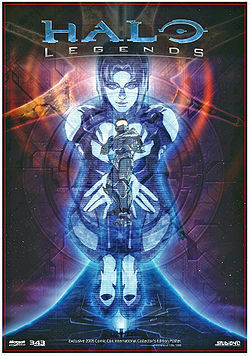 Origins is one of the seven short films comprising the anime adaptation of the Halo universe, Halo Legends. Origins is an expansive history of the 100,000 year long franchise timeline, comprised of two parts. The story is told through the eyes of Cortana and the episode begins after the events of Halo 3. As Cortana watches over John-117, currently in cryo hibernation, she begins to experience the effects of rampancy, unable to key together who she is with the massive input of information in her databanks. She then begins recounting the history of the galaxy. Over 100,000 years ago, there was once a great civilization called the Forerunners. However, their empire was invaded by a parasite called the Flood. Initially, the Forerunners treated the Flood as an infestation, until it was too late. The more Forerunners assimilated by the Flood, the more intelligent the Flood became. Soon, open war was on the rise. The Forerunners were confident that their valor and technology would stop the Flood. Unfortunately, the parasite had spread too far across their empire. On the verge of defeat, the Forerunners made one last ditch attempt to eradicate the Flood from the galaxy. They constructed the seven Halo rings and used The Ark to send the rings to different parts in the galaxy. The seven rings would destroy all sentient life and Flood biomass. Once the rings were in place, the effects of the rings cleansed the galaxy of all sentient life, including Flood, in an instant. With their enemy defeated, the Forerunners then began to repopulate the galaxy with various alien lifeforms that had been indexed, storing DNA samples, embryos and live specimens. These lifeforms were then returned to their home planets. The humans, still fresh from their encounter with the Forerunners, continue on with their civilizations. Inevitably though, much to Cortana's dismay, they fight amongst themselves. Various moments in Humanity's history, such as the invention of penicillin, the invention of dynamite, the bombing of Hiroshima, and the launches of Sputnik and the International Space Station are shown briefly. Things are all changed when Dr. Wallace Fujikawa and Dr. Tobias Fleming Shaw invent the Shaw-Fujikawa Translight Engine, allowing humanity to move across star systems. Colony ships, such as those of the Phoenix-class, are sent throughout the Orion arm of the Milky Way, settling on suitable planets. Even after finding new worlds with which to satisfy their greed, insurrection ensues, forcing mankind to once more fight among themselves. In 2525, humanity is unified against a single threat for the first time in its history. The Covenant stumble upon UNSC-controlled space, and proceed to lay waste to it. Humanity was outnumbered and outmatched in terms of technology and, for decades, the Covenant slowly laid waste to its colonies. Near the war's end, the dangerous Flood reemerges, determined to spread once again. After the Great Schism, humanity and the Sangheili then work together against two common foes, which soon leads to peace between both sides. In one scene, the Master Chief enters a Forerunner building covered in Flood growth. A Gravemind hands him what appears to be an AI memory Core. 343 Guilty Spark then emerges and transports John to the surface of Installation 08. The final scene shows Cortana attempting to make physical contact with John-117, before her eyes turn red with the Iris symbol, implying her descent into rampancy. Origins is the first official visual depiction of the Forerunners, although they are seen wearing combat skins and their true features are not shown. According to Frank O'Connor in the audio commentary for the episode, all of the visual elements of Origins are formed from Cortana's concepts of the described events, thus rendering the depiction of the Forerunners ambiguous, especially since the episode clearly shows Cortana to be either rampant or borderline-rampant. Despite this, Forerunners bearing the same design were later shown in the terminals from Halo: Combat Evolved Anniversary. Origins is also the first official work to depict life on the home planets of the Unggoy, Jiralhanae, and Kig-Yar. Some of the Forerunner structures seen in Origins are based on concepts cut from the Halo games. At one point in Part I, during the section showing the Flood being wiped out by the Halo effect, a large mass of Flood is shown attached to the top of the unused tiered structure design for New Mombasa first shown in the Halo 2 E3 demo. In addition, a version of "the Lost City", a level cut from Halo 3, is featured in Part I. Part I mistakenly depicts Halo installations deployed near Eayn, Doisac, and Sanghelios.